#The Drake Passage is the stretch of water between the most southerly tip of South America and the most northerly tip of the Antarctic peninsula. It is the place where not only are there high and strong winds that blow most of the time, but where the "Circumpolar Current" is squeezed through its narrowest gap. This is a Westerly flowing current that flows around Antarctica powered by Antarctic winds. It flows at the rate of around 140 million cubic metres (=tonnes) of water per second, or the equivalent of 5000 Amazon rivers. The Drakes passage has been described as the roughest stretch of water in the world, it is what must be navigated when rounding Cape Horn and Tierra del Fuego. To reach the Antarctic peninsula it is necessary to traverse this stretch of water at right angles to the current flow. 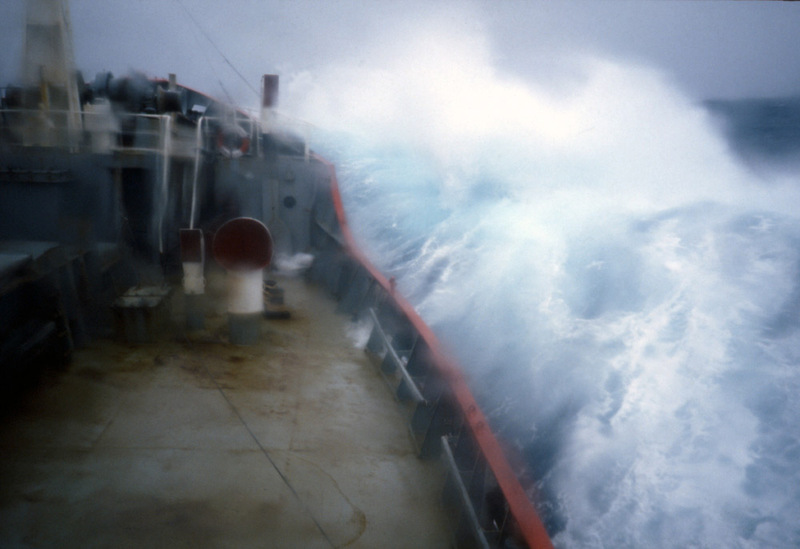 The result is often very lumpy seas indeed as seen in this shot where HMS Endurance is making the crossing.